Would you like a sales team that sells more and costs less? By having field sales reps focus exclusively on face-to-face selling and by expanding and upgrading your inside sales and client support teams, you’ll create a team of specialists. This “specialist” team approach can be far more efficient and effective than the traditional sales structure. This is the first part of a two-part article on the new sales structure. In this newsletter, Part I, we will describe the new structure. Part II will discuss how the structure can both increase revenue and reduce costs. The traditional sales structure is primarily, if not exclusively, dependent on highly compensated field sales reps. These reps are responsible for every phase of the sales cycle from generating leads to managing client relationships. The buying process has changed. The model may actually undermine profitability. First, let’s look at the buying process. Buyers no longer need sales reps to learn about a company’s products and services. That information is readily available on the internet. As a result, buyers want a very different interaction with a company’s sales representatives than they had in the past. According to SiriusDecisions, a Connecticut-based sales research firm, 67% of the buyer’s journey is now done digitally. Inside sales reps can now much more efficiently play a role previously filled by the field sales team. and expensive. 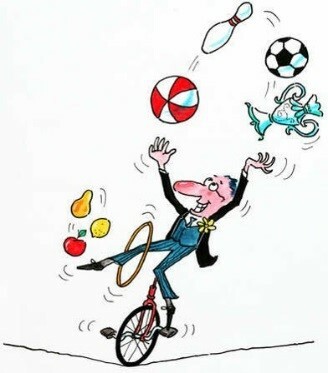 At many companies, the field sales reps look like the figure on the right: juggling multiple tasks. They generate leads, cultivate prospects, handle face-to-face meetings, negotiate deals and manage the overall relationship with the client once the deal closes. As a result, studies suggest that field sales reps spend only 40% of their time actually selling – that’s not efficient. The system is also very expensive. Field sales reps are often among a company’s most highly compensated employees. Field Sales Reps now focus exclusively on face-to-face meetings and closing larger deals. They no longer have an end-to-end relationship with the prospect/client. Inside Sales Reps take on an expanded sales role: supporting field sales by developing leads and cultivating prospects, selling to mid-sized accounts (not just small accounts), and managing relationships with existing accounts. Sales/Client Support Specialists handle routine customer service, but now they also support the field sales team by preparing presentations and proposals and ensuring that the field sales team has the necessary sales tools. 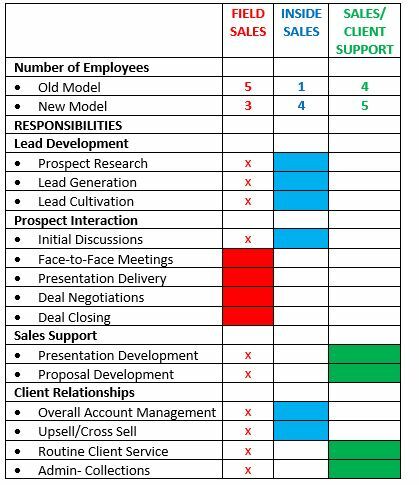 To see how a 10-person sales organization can make the shift to this new sales structure, review this chart. It shows how to reassign responsibilities from the field sales reps to the inside sales reps and the sales/client support specialists. This shift allows the company to reduce its number of expensive field sales reps and dramatically expand its less expensive inside sales and support team. In Part II of this series, we’ll use an example to illustrate the financial impact of the shift.